﻿﻿﻿﻿﻿It is more fun than you eve﻿r thought with a bit of exercise thrown in to boot! "Those who say they can't dance have not tried square dancing." So come join us now while you can! Tri Squares welcomes all dancers in either traditional square dance, western style, or even smart-casual attire as we want you to come dancing with us whatever you are inspired to wear. the second Saturday and fourth Friday of each month. 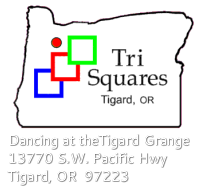 All Tri Squares' dances are held at the Grange Hall on 99W﻿ in Tigard, Oregon. If the day's temp is over 80 degrees by dance time, be sure to come in cool, casual attire. If the day's forecast is to be over 85 degrees by 5 PM, the dance is canceled. Site developed by Tri Squares Square Dance Club.